BMG’s fluid technology services include solutions for hydraulics and pneumatics, lubrication, fuel and industrial filtration systems, hydraulic hose and fittings, as well as instrumentation, pumps and industrial valves. These components are suitable for diverse hydraulic applications, as well as gear oil treatment. The filter elements are designed to reduce solid particle contamination, prevent the ingress of dirt from the environment and maintain the properties of the hydraulic fluid for an extended time period. Included are a range of FG desiccant breathers designed to protect machines from the damage caused by moisture and the ingress of particles. When contaminated air enters the top of the breather, it passes through layered filter media, blocking particles from entering and thus preventing wear to equipment surfaces. The filtered air passes through a bed of silica gel, which effectively removes moisture. Silica keeps the equipment dry by attracting moisture from inside the equipment reservoir during service or shut-down. FG desiccant breathers have an enlarged housing, which ensures up to 20% more absorption of moisture than conventional breathers. The centre tube is constructed from a robust nylon material, providing rigidity to the element and allowing an even air flow through the silica gel. For additional system protection, secondary filter media prevent any possible migration of silica dust. 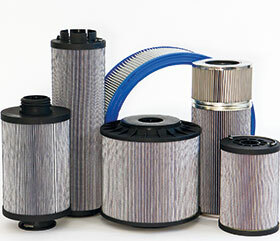 Breathers are suitable for use in hydraulic units where there is high humidity and temperature fluctuation. Typical applications include wind energy, power plants, tunnel construction, aerospace and manufacturing processes, as well as petrochemical and chemical plants.